Eleaf is so glad to introduce you another excellent pod system setup, the iTap! iTap is a portable pod system device which boasts innovative dry-burn protection, making it a definitely different one. Equipped with internal 800mAh battery, iTap is another ultra compact yet powerful e-cigarette starter kit. The iTap comes paired with a newly designed pod that features a refined airflow system and the GS Air coils optimized for flavor. Simple, secure and smart, the iTap is certainly a cut above the rest. Eleaf is so glad to introduce you a new iStick series product, the iStick Mix. iStick Mix, “Art Mix Tech”, is a very personalized product. From the appearance, iStick Mix has never used a different two-sided finish – IML and Resin, which is also one of the connotations of “mixed life”. At the same time, iStick Mix combined with TYPE-C and balanced charging technology, charging is more efficient and safer than ever. Powered by dual 18650 batteries, iStick Mix can fire up to 160 watts. Paired with the ELLO POP atomizer that utilizes the HW-N2 and HW-M2 mesh coils and has smartly designed childproof system, iStick Mix presents you a distinctive vaping experience. In a short, iStick MIx is a unique, artistic and technical product that brings you a brand-new feeling. Eleaf is so glad to introduce you a new iJust series product, the iJust 21700. Eleaf is so glad to introduce you a new pod system, the Elven. Having beautiful and durable metallic finishes, Eleaf Elven is a new sleekly designed pod vape. You’ll get different air inflows from the Elven by inserting its pod into the battery in two ways. This pod features an easy side-fill solution and is leakage-free. The Elven is quite simple to use for its no-button feature that automatically initiates when you inhale. It is optimized for nicotine salts especially using the 1.6ohm coil contained within the pod. Offering great convenience and portability, Eleaf Elven pod is a great option for vapers on the go or simply looking for an easy to use vape. We’re so glad to introduce you the new legend of vaping world, the iStick NOWOS. Eleaf iStick NOWOS is leading the way with the innovative LED digital display and touch buttons, where aesthetic looking meets easy operation. It houses a mighty 4400mAh battery and supports QC3.0 / PD3.0 protocol for faster charging than ever. Another revolution is the use of TYPE C. Unlike older USB cable, it doesn’t matter which side is up with the TYPE C. Designed to be exceptional in every way, the ELLO Duro atomizer that is paired with the iStick NOWOS comes with two new kinds of dual mesh coils: the HW-M Dual 0.2ohm Head & the HW-N Dual 0.25 ohm Head, bringing you the best vaping experience. Eleaf is so glad to introduce you a new glamorous tube kit, the iJust ECM. Eleaf is so excited to announce the opening of an online store. Feel free to click on: https://www.eleafworld.com/online/ to purchase. To celebrated this grand opening, we offer great discounts on all products, free shipping by DHL for orders over $29.99 during the first week, priority to the latest products, free gifts for some specified products and so on. Wish you a happy shopping experience on Eleaf store! Eleaf is so glad to introduce you a new small yet efficient vape kit, the iStick Amnis with GS Drive. Eleaf is so glad to introduce you a new pod system with innovative design, the iWũ. The Eleaf iWũ is a sleekly designed refillable pod system with a protective hollow-out cover design that allows you to conceal the mouthpiece. The pod system boasts an innovative and leakage-free side-fill solution and can hold 2ml e-liquid. The iWũ is quite simple to use for its no-button feature that automatically initiates when you inhale. Packed with a 700mAh inbuilt battery, the iWũ remains a remarkably small size and is ultra portable. It is optimized for nicotine salts especially using the 1.3ohm coil contained within the pod. Offering ultra convenience and portability, Eleaf iWũ is a best option for vapers on the go or simply looking for an easy to use pod vape. Eleaf is so glad to introduce you a new elaborately designed box mod, the Saurobox. The Saurobox is a high performance mod by Eleaf, coupled with an aesthetically attractive design that covers its whole body with a special kind of resin material. Not only beautiful and spectacular, this kind of resin material also makes the Saurobox ultra light in weight and easy to hold and carry. Powered by dual 18650 batteries, the Saurobox can fire up to 220 watts and presents a clear and bright 0.96-inch TFT color display. The Saurobox also has features including an user-friendly firmware, 2A quick charge and balance charging capabilities. Experience the distinctive vaping with Eleaf Saurobox! We’re so glad to introduce you Eleaf new Squonker kit, the Pico Squeeze 2 with Coral 2. The Pico Squeeze 2 with Coral 2, an upgraded version of previous Pico Squeeze kit, is a new regulated Squonker that features an easy-to-squeeze silicone bottle and a decorative 7-color LED. The refillable Squonk bottle can hold an ultra huge amount of e-liquid of 8ml, extending the time between refills. Powered by single 21700 or 18650 battery, the Pico Squeeze 2 provides adjustable wattage and can fire up to 100 watts. With the addition of an elegant acrylic mouthpiece and a faster firing speed, the Pico Squeeze 2 with Coral 2 is a must-have for all build enthusiasts to enjoy vaping to the most. We’re so glad to introduce you Eleaf new Lexicon with ELLO Duro (acrylic version). And in order to make refilling easier for users, Eleaf changed the structure of this GS Baby tank to make top fill possible. 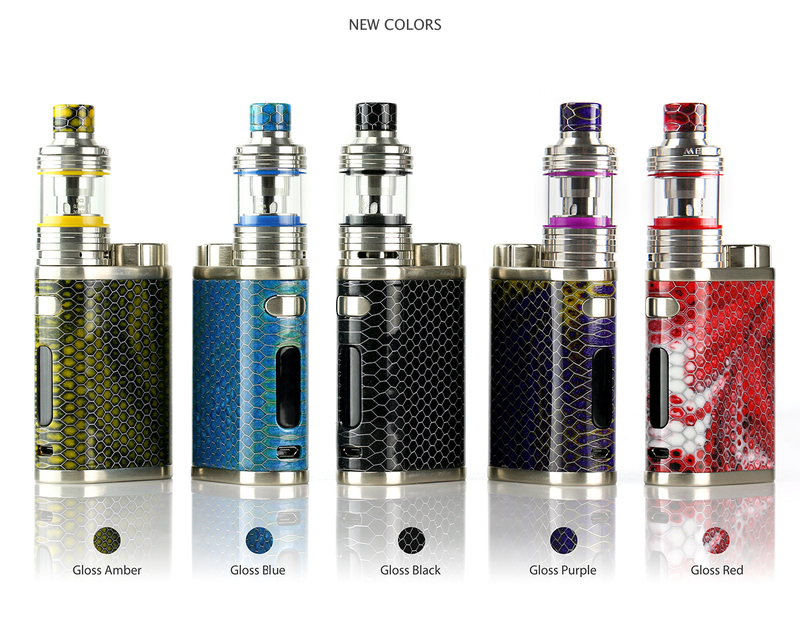 We are so glad to introduce you a new honeycomb resin style iStick Pico kit. This new iStick Pico Resin with MELO 4 features all-new reimagined EC-N (Net) and EC-M (Multihole) coil systems, presenting an unprecedented vaping experience with ultra flavorful taste and huge clouds. A durable resin encasement of light weight and comfortable texture, and its elegant honeycomb looking makes it stand out from others. Powered by single interchangeable 18650 cell, the iStick Pico Resin provides you with 75W maximum output and upgradeable firmware. With retractable top fill solution and resin style mouthpiece, the MELO 4 atomizer fits this new iStick Pico RESIN perfectly in terms of both looking and performance. Eleaf is so glad to introduce you a new member of iStick Pico family, the iStick Pico S, paired with a new atomizer named ELLO VATE. Eleaf is so glad to introduce you a new upgraded version of iJust series, the iJust 3 with ELLO Duro. The new Eleaf iJust 3 kit has the most gorgeous looking than ever and boasts all-new reimagined Net and Multihole coil systems, presenting an unprecedented vaping experience with ultra flavorful taste and huge clouds. Powered by an internal 3000mAh battery, the iJust 3 is capable of firing up to 80 watts. Its intuitive four color LEDs are for ease of checking battery level. Paired with a new ELLO Duro atomizer which features retractable top fill, with the addition of 6.5ml / 2ml options, this iJust 3 kit is one of the must-have setups for all sorts of vapers. Eleaf is so glad to introduce you a new compact ALL-IN-ONE, the iCard. Just as its name implies, the Eleaf iCard is a new all-in-one style setup having an ultra thin and compact profile, with the addition of a dual-purpose cover. It boasts an innovative refilling system where fill port can easily be accessed by unlocking the tank and rotating it, making refilling of an all-in-one faster and easier than ever. By utilizing the new ID coil, the iCard is designed to provide a great vaping experience with enhanced flavor. You’ll know its battery level simply by checking the color of the LED. Offering brilliant functionality and great portability, the iCard is perfect for both new vapers and vapers looking for a solid backup. Eleaf is so glad to introduce you a new recessed tank style vape kit, the iStick Pico Baby with GS Baby. The Chinese Spring Festival of 2018 is just around the corner. Here all the staff from Eleaf wish you and your families good luck in the new year. To celebrate this traditional Chinese New Year, Eleaf is scheduled for a 12-day holiday from February 11th to February 22nd. If you are interested in our products, please feel free to reach us at info@eleafworld.com. Any problems or concerns, please contact your local retailers for help or email us at service@eleafworld.com. During this period of time, we feel so sorry that we may not be able to reply to you timely but we will give corresponding reply soon after we are back to work. We are really sorry again for the inconvenience brought to you and greatly appreciate your kind understanding. Eleaf is so glad to introduce you a new beautiful, powerful and rich featured vape kit, the TESSERA with ELLO TS. Designed with low-poly elements and high-performance experience in mind, the new TESSERA is elaborately engineered in every single detail to be not only visually appealing but versatile. It features a 1.45 inch TFT color display and an all new UI system, with the addition of 5 theme colors for your option. A beast behind the beauty, the TESSERA is capable of firing up to 150 watts and has a maximum of 2A charging for efficient recharging. The TESSERA comes paired with a newly designed ELLO TS atomizer that utilizes HW coils for intense flavor and clouds. For better enjoyment of vaping, all you need is just this TESSERA with ELLO TS kit. We are so glad to introduce you a new compact yet powerful box mod, the iStick MELO. The new iStick MELO features a long sustainable 4400mAh inbuilt battery that can be recharged efficiently and safely and can fire up to 60 watts, while its slim and compact profile enables you to effortlessly carry and store the device. The top of the iStick MELO is equipped with a 0.49” screen, allowing you to view all essential information with a simple glance even while vaping. Alongside the iStick MELO is the MELO 4 (D22) atomizer, a retractable top fill tank that utilizes EC2 coils for an ultra vaping experience. This perfect combination of the sleek iStick MELO mod and the well-performing MELO 4 tank is optimal for all vapers. Eleaf is so glad to introduces you a newest addition to iStick Pico family, the iStick Pico 21700.
iStick Pico 21700 is compatible with single 21700 battery as well as 18650 battery and provides a high drain 4000mAh 21700 battery for your option. It is capable of running up to 100W and has a maximum of 2A charging for efficient recharging. Included with the iStick Pico 21700 is the ELLO tank, a retractable top fill and extendable tank that introduces a new HW1-C coil. Featuring a ceramic wrapped wick system for heat preservation, this HW1-C coil can provide a great and efficient vaping experience with enhanced taste. 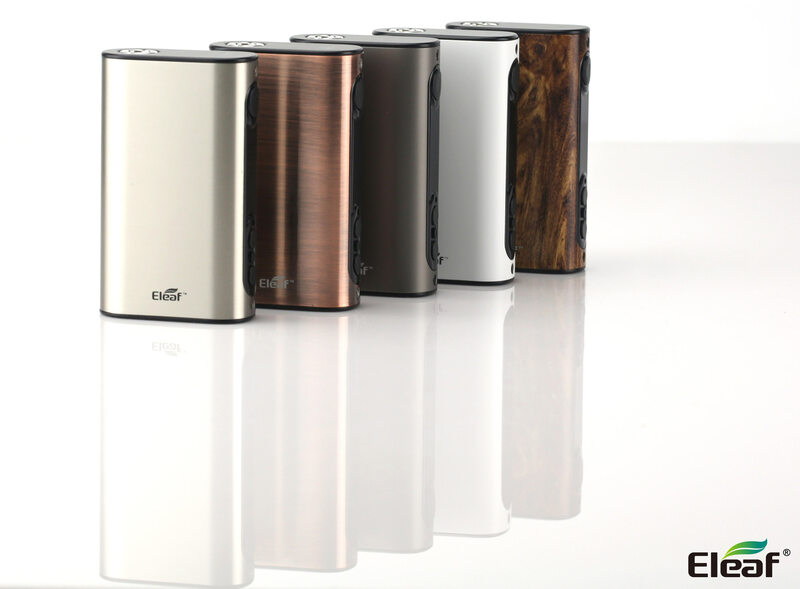 Eleaf is so glad to introduce you a new vape kit with innovative finishes, the BASAL kit. We’re so glad to introduce you 3 new colors for iStick Tria with ELLO S. They are gold, blue and red. We’re so glad to introduce you a remarkably small box mod, the iStick Kiya with GS Juni. 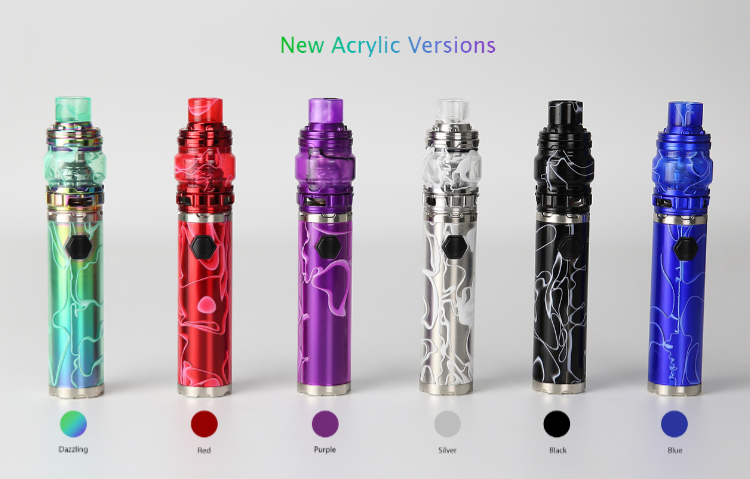 Sneaky small but full-on capable, the new iStick Kiya comes with ultra small dimensions while ingeniously packs a large 1.45-inch rich color display with new bright interface and real-time clock in such a diminutive body. Equipped with the temp protected charging system and 2A charging current, the iStick Kiya enables its charging process securer and faster. Featuring a refined airflow system, the new tiny GS Juni atomizer with its popular GS Air coils will give you a great vaping experience. We’re so glad to introduce you the new Eleaf Invoke with ELLO T.
The Chinese National Day is approaching. To celebrate it, Eleaf factory is scheduled for a 8-day holiday from October 1st to October 8th. During this period of time, if you are interested in our products, please feel free to reach us at info@eleafworld.com. Any problems or concerns, please contact your local retailers or email us at service@eleafworld.com. We will give corresponding reply soon after we are back to work. Eleaf is so glad to introduce you a new exquisite starter kit named iStick Trim with GSTurbo. Eleaf is so glad to introduce you a new vapor beast named iStick Tria with ELLO S.
The iStick Tria accepts triple 18650 batteries and is capable of firing up to 300W, allowing a much more massive vapor production than ever. The overall compact profile and stylish visual appeal of the iStick Tria make this powerful vape mod stand out from others. The ELLO S atomizer features retractable top for easy e-liquid filling and comes with HW coils for great vaping experience with enhanced flavor. Having 0.91-inch screen, upgradeable firmware, 2A quick charge and reverse charge capabilities, this full-featured iStick Tria with ELLO S is a must have vaping setup for cloud chasers. Eleaf is so glad to introduce you an upgraded version of the iCare, the iCare 2. Eleaf is so glad to introduce you two new e cigarette kits: the iKuu i80 and the iKuu i200, both matching with the MELO 4 tank. The iKuu i80 and iKuu i200 both feature an innovative temperature protection system of charging that highly secures the safety of charging process. Temperature range for charging is -5℃-50℃ or 23℉-122℉. 2A quick charge capability along with an easily accessible charging port allows charging much faster and more convenient. The iKuu i80 has a 0.91-inch screen and is capable of outputting 80 watts of power while the iKuu i200 features a bigger 0.96-inch screen with all new interfaces and fires up to 200 watts. The MELO 4 atomizer features a new EC2 series coil which is the upgraded version of the popular EC coil. To fill the tank, you simply need to slide the drip tip back to reveal the fill port and fill e-liquid in. Not only does the MELO 4 come in various colors for your choice, it also provides you with two optional versions, one with 25mm diameter and 4.5ml e-liquid capacity and the other with 22mm diameter and 2ml capacity. Eleaf is so glad to introduce you a new skillfully engineered dual 18650 mod, the Eleaf iKonn 220 with ELLO. Powered by two 18650 batteries, the Eleaf iKonn 220 is capable of outputting a maximum power of 220W. It features a big 0.91-inch screen that offers a concise and clear interface with two separate battery bars. A battery balancing trickle charge system is adopted to bring two batteries to the equal level charge. And with 2A maximum charging current, the batteries can be fully charged much more quickly. To pair with the powerful Eleaf iKonn 220, the ELLO comes with two new powerful HW3 and HW4 coils to provide huge vapor clouds. To fill the tank, simply slide the drip tip back to reveal the fill port and fill e-liquid in. iStick Pico 25 ingeniously packs a big 0.91-inch screen that offers a concise and clear interface, 2A quick charge capability and upgradeable firmware with preheat function in a compact, stylish yet powerful package. Powered by single 18650 battery, the iStick Pico 25 is capable of outputting a maximum power of 85W and can handle various tanks up to 25mm diameter. The ELLO atomizer that features the HW coil for ultimate flavor and retractable top for easy filling pairs with the iStick Pico 25 perfectly in terms of both appearance and performance. Eleaf is so glad to introduce you a new member of iJust family, the iJust NexGen. The iJust NexGen not only comes with the well-made HW coil that is designed for big vapor clouds with enhanced flavor, but also features the retractable top system for ease of filling the tank. Being an all-in-one style setup, it skillfully packs a long sustainable built-in 3000mAh battery with a tank in a compact tube-like unit. With a single button to operate it, the iJust NexGen is quite easy to use. Also with intuitive four color LEDs, you can easily check the battery status by a simple glance at the color of the light. Eleaf just released a new RDTA mod for you, the iStick Pico RDTA. The iStick Pico RDTA is a skillfully designed all-in-one style setup, presenting the same excellent performance as the popular iStick Pico and an innovative rebuildable dripping tank system in a compact yet stylish package. The tank can easily be refilled by a large fill port on the base and has an internal light that helps check e-liquid level. A removable dual post deck, an 8-hole adjustable and extensive airflow, a wide bore drip tip and an easy wicking system all make the iStick Pico RDTA a must-have for all build enthusiasts to enjoy vaping to the most. Eleaf just released a new skillfully engineered e-cigarette kit for you, the Eleaf iKonn Total with ELLO mini. The Eleaf iKonn Total is a new innovative recessed tank style setup with hidden button design, offering easy operation and excellent performance in a simple, compact and stylish package. It comes with a new design of hollow sliding cover that not only cleverly reveals e-liquid consumption but also protects the tank inside. Powered by single 18650 battery, it allows you to carry spare batteries when on the go. With 22mm diameter, retractable top fill method and new HW series coils, the ELLO mini/ELLO mini XL atomizer pairs perfectly with the Eleaf iKonn Total. Eleaf just released a new e-cigarette kit for you, the iJust X. The iJust X features a modern and stylish unibody design with a tank and a 3000mAh battery encased in two metal tubes separately. The tank section can hold a massive amount of e-liquid of 7ml, extending the time between refills. You can fill the tank from the top conveniently by just removing the top cap. The innovatively designed e-liquid inlet system cleverly prevents e-liquid leakage. When used with the popular EC coils, the iJust X will provide you with a great vaping experience. Slick looking, simple using and easy carrying, the iJust X is one of the best e-cigarettes. We’re so glad to introduce you another 5 all-new special colors for Eleaf popular iStick Pico. They are dazzling, red crackle, brushed black silver, brushed gunmetal and wood grain. We’re so glad to introduce you five all-new finishes for our iJust S. They are wood grain, red crackle, dazzling, brushed black, and brushed bronze. Lighting up your life with wonderful colors! Eleaf just released a new powerful, efficient and slick looking mod for you, the iStick QC 200W. We’re so glad to introduce you a new RESIN style iStcike Pico we just released. The Chinese Spring Festival of 2017 is just around the corner. Here all the staff of Eleaf wish you and your families good luck in the new year. To celebrate this traditional Chinese New Year, Eleaf factory is scheduled for a 11-day holiday from January 24th to February 3rd. If you are interested in our products, please feel free to reach us at info@eleafworld.com. Any problems or concerns, please contact your local retailers for help or email us at service@eleafworld.com. During this period of time, we feel so sorry that we may not be able to reply to you timely but we will give corresponding reply soon after we are back to work. We just released a most powerful tank ever for you, the MELO 300. The MELO 300 features a new ES Sextuple-0.17ohm Head that consists of six coils and is rated at an ultra high power of 100-300W for huge vapor production. The retractable top fill system makes it really easy to fill the tank. You just need to slide the drip tip back and it reveals the fill port. The airflow can easily be adjusted by turning the control ring with knurled design. In addition, the MELO 300 comes in two kinds of e-liquid capacity for you to choose from: 3.5ml type and 6.5ml type. Enjoy the awesome cloud chasing tank! We’re so glad to introduce you a new member of our iJust series products, the iJust ONE. The iJust ONE, an all-in-one style starter kit, skillfully integrates a built-in battery with a 2ml tank in one tiny tube-like unit. With a single button to operate it, the iJust ONE comes across as an ordinary starter kit, but there is more to it than meets the eye. Not only can it be used with popular EC coils for direct lung inhaling, it is also compatible with GS coils for mouth to lung inhaling when using the provided EC Sleeve. In addition to the convenient top fill method, the iJust ONE is available in various attractive colors for your choice. We just released a new skillfully engineered box mod for you, the Pico Dual. According to customers’ demands, we just released another two all-new finishes for our popular iStick Pico: jet black bronze & white bronze. Hope you like them and vape on! We just released a new skillfully designed kit, the ASTER RT with MELO RT 22, and a powerful atomizer, the MELO RT 25. The ASTER RT is a “Recessed Tank” (RT) style compact mod that is able to hold and hide tanks up to 22mm diameter. It is pre-installed with the new firmware that has preheat function and custom logo as well as different interfaces for you to check your total puffs and total vaping seconds. Also the firmware is upgradeable to be always the latest. The MELO RT 22 features its innovative “Retractable Top” (RT) solution which makes e-liquid refilling the easiest and most convenient ever. With a diameter of 22mm, the tank pairs perfectly with the ASTER RT. The MELO RT 25 also retains the innovative “Retractable Top” (RT) fill solution. Its new ERL series coil heads are skillfully designed for ultra high power, enabling a huge amount of vapor production. The wide bore drip tip sits perfectly on the tank with a large diameter of 25mm. Also airflow can easily be adjusted by turning the control ring with knurled design. We just released a new compact mod with built-in tank for you, the ASTER Total. The ASTER Total is an integration of a built-in battery and an internal tank in one unit. It still retains the ergonomically redesigned shape of original ASTER, perfectly fitting in the palm of your hand. It is comfortable and easy to use with conveniently placed fire button. The e-liquid can easily be refilled by removing the top cap and the airflow can be adjusted to your preference. Also you can change the color of your ASTER Total whenever you like by replacing its leather sticker. We just released a new firmware version 1.03 for all our upgradeable mods including iStick Power, ASTER, iStick Pico, iStick Pico Mega, iStick TC200W and iStick TC100W. This new firmware features the four switchable display interfaces: Puff interface, Second interface, Voltage interface and simplified interface, allowing you to check your total puffs and total vaping seconds as well as to choose the interface you are most accustomed to. Also the preheat function is added. Moreover, another firmware V1.13 is launched for iStick TC100W users to not only have the above mentioned amazing features of firmware V1.03 but also maximum output power of 120W. And keep enjoying the vaping! We just launched TPD notification platform for all our wholesalers and retailers to speed up the TPD notification of Eleaf products. http://www.eleafworld.com/download_tpd/. Also please first refer to the Guidance on TPD Notification.pdf to know more about how to complete the notification process. Our National Day is drawing near. To celebrate it, Eleaf team will take 7 days off from October 1st, 2016 to October 7th, 2016. In the 7-day period, we are sorry that we may not reply to your emails in time. But if you are interested in our products, please feel free to reach us at info@eleafworld.com. Any problems or concerns, please contact service@eleafworld.com. We will give corresponding reply soon after we are back from holiday. We feel so sorry again for all the inconvenience caused to you. We just released a new firmware version 1.02 for iStick Power, ASTER and iStick TC200W. And here we would suggest all of you to try to upgrade your mod as this is also the most accurate way to verify the authenticity of the mod purchased. We just released a new firmware V1.02 for our iStick Pico, iStick Pico Mega and iStick TC100W. This version of firmware is updated with a boot/shutdown animation, a more simplified TC interface and an intuitive progress bar of vaping time. Also another firmware V1.12 is launched for iStick TC100W users to not only have the above mentioned amazing features of firmware V1.02 but also maximum output power of 120W. We’re so glad to introduce you our innovatively designed e-cigarette kit, the Pico Squeeze with the Coral. The Pico Squeeze with the Coral is compact in size and simple to use. This kit mainly features a reimagined Squonk system and a bottom-fed rebuildable drip atomizer that the coils inside can be saturated conveniently by squeezing the Squonk bottle to let e-liquid in. The refillable Squonk bottle can hold 6.5ml of e-liquid, extending the time between refills. Simple, compact, and sustainable, that’s the Pico Squeeze with the Coral. We just released a new perfectly combined e-cigarette kit, the iStick Power Nano with MELO 3 Nano. We just released new skillfully designed iCare series products, the iCare & the iCare Mini with PCC box. The iCare is a compact e-cigarette kit with an internal tank and airflow system. It is quite simple to use for the automatic On/Off feature that initiates when vaping. The e-liquid can be refilled into the tank from top with ease. By using a higher strength e-liquid, the iCare perfectly recreates the sensation you are accustomed to. Also with intuitive three color LEDs, you can easily check the battery status by a simple glance at the color of the light. The iCare Mini is even tinier and cuter while still retaining all the features of the iCare. Another highlight is that the iCare Mini comes with a PCC box of 2300mAh battery capacity which performs like a power bank for iCare Mini and thus will last you a rather long time of vaping. We just released two new atomizers, the Lemo Drip and the OPPO RTA. Lemo Drip is the first Rebuildable Drip Atomizer (RDA) by Eleaf. This RDA is made of stainless steel, making it both durable and fashionable. Not only does it have wide open space for ease of installing coils and cotton, it also has large air inlet slots for huge vapor production and the airflow can be adjusted to your preference as well. The wide mouthpiece is another plus to great vaping and nice flavor. OPPO RTA is a new Rebuildable Tank Atomizer (RTA) with an e-liquid capacity of 2mL. Compact yet efficient, it not only has large build space for ease of installing coils and cotton, but also has the most airflow for huge vapor production and nice flavor. The e-liquid can be refilled from the top by removing the top cap only, allowing much more convenience in use. We have a good news for you. Today we released a new e-cigarette battery, the ASTER. Beautiful and colorful, ASTER is a skillfully engineered product by Eleaf with a fashionable metallic appearance. Powered by single interchangeable 18650 cell, it is capable of outputting up to 75W of power. It also features the upgradeable firmware and convenient side charging port. With an ergonomically redesigned shape, you can hold it in the palm with ease and comfort. Here we’d like to inform all of you that we decided to gradually change the name of “iPower” to “iStick Power” due to a trademark dispute in China area after negotiation. The change is ONLY the name. Except the name, there is no other change on this product itself. Please be rest assured that this change has no any effect on our product quality and sales. We are switching packages now, and plan to finish this adjustment before Sept. 13th. We’re so glad to introduce you another skillfully engineered e-cigarette kit we just released, the iStick Pico Mega kit. iStick Pico Mega, an upgraded version of original iStick Pico, is compatible with both 26650 and 18650 batteries. It is updated with the new firmware which features a simpler interface for VW mode, a Smart mode for easy operation and a custom logo for fun. When used with newly added NotchCoilTM, the combination of iStick Pico Mega and MELO III/MELO III Mini atomizer will bring you a great vaping experience. 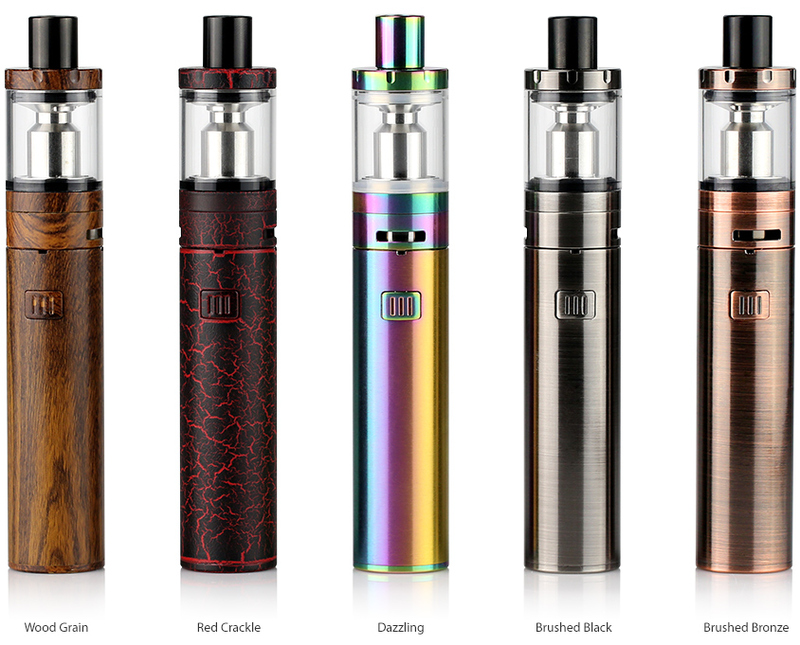 We just released a new starter kit, the iJust S.
The iJust S has a larger diameter of 24.5mm and a higher battery capacity of 3000mAh compared to previous iJust series kits. All parts of the iJust S atomizer can be detached and reassembled, bringing much more convenience in cleaning and maintenance. The e-juice can be refilled by removing the top cap only with ease. When used with new ECL 0.18ohm Head, the iJust S will bring you a different vaping experience with nice flavor. When you are on a trip or when you are out for a long time, one of the most terrible things must be that your cell phone is nearly dead and you could hardly find anywhere to charge it. And for vapers, another headache must be that their e-cigarette boxes can not last long. Although the worry is eliminated to some extent for the new design of e-cigarette boxes with replaceable batteries, vapers need to spend extra money in buying various spare batteries. So where to find an e-cig box that lasts longer and saves money becomes a common concern among vapers. Sleek looking, pretty colors, compact size yet huge capacity make iPower a great e-cigarette mod that all vapers don’t wanna miss. 5000mAh makes it much more endurable and sustainable than you could ever imagine. But without having a try, you will never know how amazing it really is. Eleaf just released a new skillfully engineered mod, the iStick Power. The iPower comes with an ultra-large battery capacity of 5000mAh in a compact design, which can last you for a remarkably long time at any iPower setting. Not only does it apply the new firmware with Smart mode and custom logo, the iPower also has a fashionable looking and comes with many attractive colors for your options. We just released an innovatively designed atomizer, Lemo 3. Not only can this new atomizer be used with replaceable atomizer head, but it can also be used with pre-made or self-built coil as RTA for DIY fun. The e-juice can easily be refilled from the top by removing the top cap only. Also all parts of Lemo 3 can be detached and reassembled, allowing convenience in cleaning and maintenance. We just released a new firmware for iStick Pico–the version 1.01. This new firmware features a simpler interface for VW mode, a Smart mode for easy operation and a custom logo for fun. We just released a tiny starter kit for new vapers, the iNano. Being extraordinarily small in size, the iNano has a battery capacity of 650mAh. The atomizer is smartly inserted and locked in the box by a magnetic connector, which is much more convenient to use and carry. It also comes with five colors for your choice: silver, black, grey, hot pink and gold. We just added two new colors for iStick Pico Kit for your preference. They are full black and brushed silver. Also iStick Pico battery in full black and brushed silver and MELO III/MELO III Mini atomizer in black are available. Eleaf just released eleven kinds of sticker designs for you to cover your iStick Pico and protect it from scratches and day-to-day wear. The fashionable designs will also make your iStick Pico different from others’. Love your iStick Pico, dress it up! Breaking news! We just released an innovatively designed atomizer for you, the LYCHE atomizer. We just added another two colors for the iStick TC40W for your preference. They are full black and brushed silver. 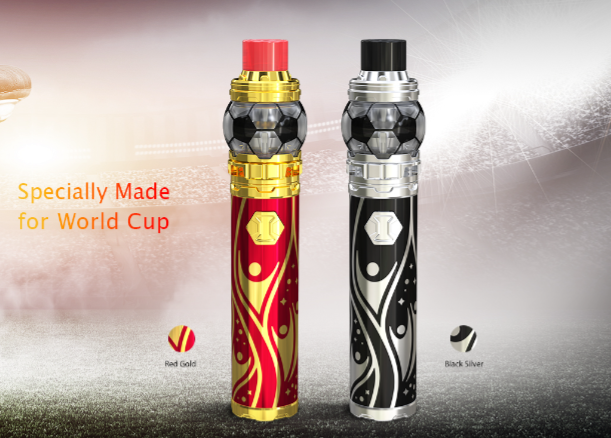 To cater to different needs, we just released a Mini version of iJust 2 Kit–iJust 2 Mini Kit for your preference, which is smaller in size and has 2ml e-liquid capacity and 1100mAh battery capacity. Tiny yet still efficient, the iJust 2 Mini retains the unique atomizer base for better heat dissipation and side USB port design for convenient charging. When working with EC coils, it will bring you a great joy in vaping. Today we released a skillfully engineered powerful mod for you–iStick TC200W. Powered by three 18650 cells, the iStick TC200W delivers a huge amount of vapor at 200w maximum output. Powerful yet intelligent, the iStick TC200W packs with upgradeable firmware and TC(Ti/Ni/SS/TCR)/VW modes for your preference. In addition to the unique design of flip-open battery cover, the innovative streamlined shape with metallic finish also makes the iStick TC200W fashionable in hand and comfortable to grip. 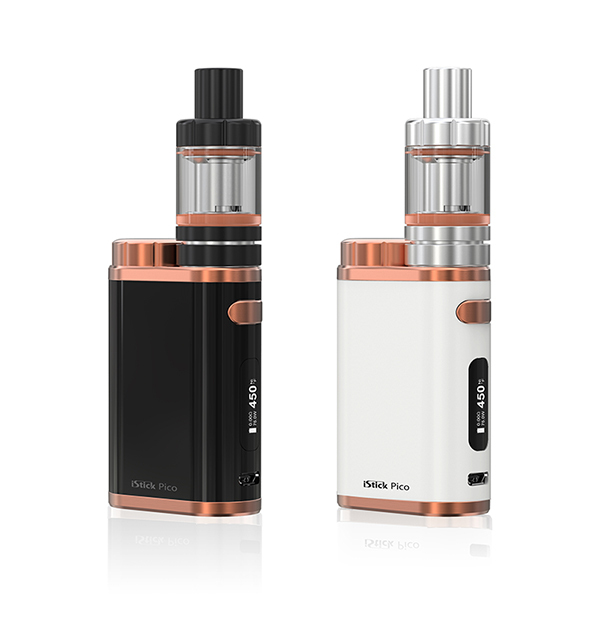 We just released a new compact e-cigarette kit–iStick Pico with MELO III Mini atomizer. 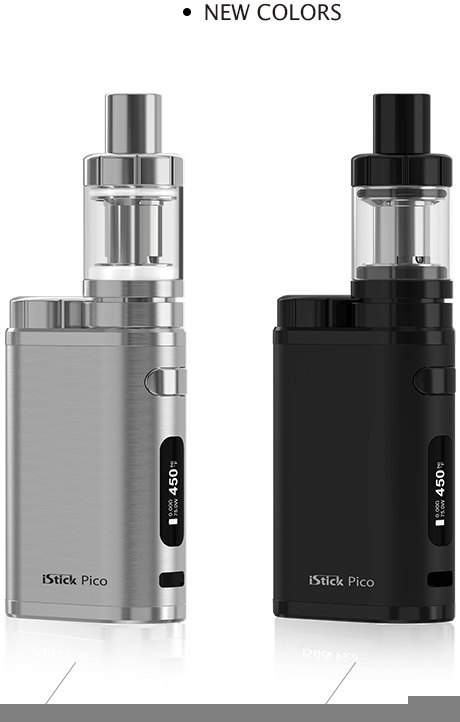 Just as its name implies, the iStick Pico is preferable, innovative, compact and outstanding (PICO). Powered by single interchangeable 18650 cell, it provides you with 75W maximum output and switchable VW/Bypass/TC-Ni/TC-Ti/TC-SS/TCR modes. The tiny MELO III Mini made of stainless steel fits the iStick Pico perfectly both in terms of appearance and performance. Eleaf just released a new firmware V1.10 for iStick TC100W. This new firmware allows a higher output power of 120W. Being more powerful, the iStick TC100W will give you another different vaping experience after upgrading. The Spring Festival of 2016 is approaching. All the staff of Eleaf wish you and your families good luck in the new year. To celebrate this traditional Chinese new year, Eleaf factory is scheduled for a 10 days holiday from February 5th to February 14th. If you are interested in our products, please feel free to reach us at info@ismoka.com. Any problems or concerns, please contact your local retailers or email us at service@ismoka.com. We will give corresponding reply soon after we are back to work. Here we’d like to first express our heartfelt appreciation to you for your support and accompany in the past years and in the new year we will strive to keep with the good work and bring you many surprises. The first surprise is the iStick TC100W we just released. Powerful yet more intelligent, the new iStick TC100W is skillfully engineered with the latest temperature control system and upgradable firmware. An ergonomically designed shape with hidden button is for better grip action. There are also three classic colors for you to choose from: black, white and grey. Happy new year 2016 . Eleaf factory will take 3 days off from January 1st, 2016 to January 3rd, 2016. In the 3-day period, we are sorry that we may not reply to your emails in time. But if you are interested in our products, please feel free to reach us at info@ismoka.com. Any problems or concerns, please contact service@ismoka.com. We will give corresponding reply soon after we are back from holiday. Christmas is just around the corner. We’d like to first express our best wishes to all of you and your family here. Also we have a good news for you. Eleaf today launched another new e-cigarette kit–iJust start. Being simple in structure and easy to operate, the new iJust start fully embodies its lovely name “I just start”. With a tiny and colorful appearance, it also comes with two specifications for you to choose from: iJust sart (1300mAh,Φ16.5mm) & iJust start Plus (1600mAh,Φ19mm). When used with the new GS Air 0.75ohm atomizer head, it will give you a great taste. Eleaf today released a new starter kit–the iStick basic with the GS Air 2 atomizer (14mm). Our National Day is drawing near. Eleaf factory will take 6 days off from October 1st, 2015 to October 6th, 2015. In the 6-day period, we are sorry that we may not reply to your emails in time. Eleaf just released the upgraded iStick TC60W and the new MELO 2 atomizer. The newly engineered iStick TC60W packs with temperature control technology supporting both Nickel 200 and Titanium coils, as well as general Kanthal coils. Being changeable and colorful, its magnetic covers are designed for ease of switching your 18650 cell and changing the covers into a different color. When applied with the MELO 2 atomizer, the iStick TC60W will bring you a perfect vaping experience. Today Eleaf release another new addition to iStick series–iStick 100W. Powerful yet slick looking, the iStick 100W is streamlined with innovation and technology. Not only does the iStick 100W deliver a satisfying amount of vapor at 100w. It also features strong magnetic back panel for ease of switching your 18650 cells and packs with the functionality of charging your cells. The bright OLED screen displays clearly current settings and battery life, allowing you to check the status of the device with a simple glance. An elegant, ergonomically redesigned shape is for better grip action. From first coming into the market till now, Eleaf has always been providing e-cigarette lovers with various products of excellent quality and favorable price. Now, Eleaf is well-known in the market. However, its popularity also incurs a lot of imitations from other e-cigarette manufacturers. Both the outer appearance and inner structure of our Eleaf products are copied. Those imitations are inferior in quality and seriously damage the product reputation of Eleaf in the market. Under this situation, we has upgraded our anti-counterfeiting system timely so as to provide you with the best service. We still offer 90-day free-replacement warranty service for all our products of quality problems. Please contact: service@ismoka.com for any questions or concerns about our products, and we will give corresponding reply within 72 hours. A specially designed laser code is added to iJust 2 and newly released iStick TC40W for anti-counterfeiting. The laser code will permanently be accompanied with the device. Even if you don’t have the security code any more, the authenticity can also be checked with the laser code provided. Eleaf will always provide you with first-rate service. If there are any suggestions about improving our products, kindly please contact us online via our email or official Facebook. Eleaf today launch iStick TC40W. It is a skillfully engineered battery implementing the latest technical element–Temperature Control. The iStick TC40W will give you different vaping experience without any dry hit when set at different temperature. It will consume much less battery power and e-liquid in TC mode. With four colors to choose from: black, blue, silver, grey, you are sure to find a model most satisfying to your taste! Today the GS-Tank atomizer, a latest GS series atomizer, is released. It is 22mm in diameter with liquid capacity of 3ml. When using GS Air TC head with pure cotton, the GS-Tank atomizer can be compatible with various temperature control batteries, especially the iStick TC40W. Today iJust 2 Kit, an upgraded e-cigarette, is released. It is ready for you now. iJust 2 Kit features simple and elegant appearance with light weight. By adopting dual coil EC head, it will bring you a different vaping experience. Hope you love it and enjoy every vaping! Today we release several upgraded versions of atomizer heads which all adopt pure cotton wick. Two kinds of Temp Control version with Nickel 200 heating wire are adaptable to all temperature control batteries. The May Day is coming soon. Eleaf will take 3 days off from 1st May 2015 to 3th May 2015. We may not reply your emails in time during these days. However, if you have any question or need our help, please feel free to contact us. We will give you response once we are back. Sorry again for the inconvenience and thanks for your understanding. Eleaf would like to take this opportunity to wish you all the best in the holiday! The Tomb-sweeping Day is coming soon. Eleaf will take 2 days off from 5th April 2015 to 6th April 2015. We may not reply your emails in time during these two days. However, if you have any question or need our help, please feel free to contact us. We will give you response once we are back. 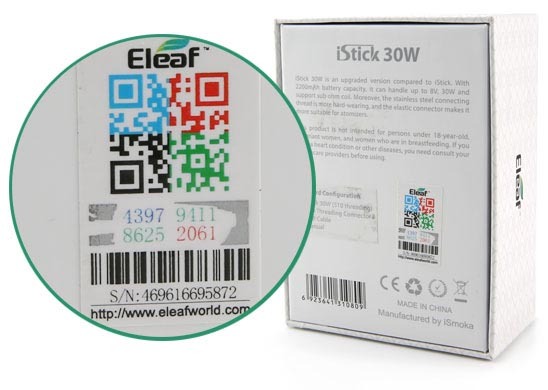 Eleaf today publicize the stickers of iStick 50W which will enable users to protect and personalize their devices better. There are totally five kinds of patterns being well-designed for your option. Now, gently paste them on iStick 50W to avoid abrasion and you will become a fashionable vaper! Today we release the latest atomizer of famous Lemo series ——the Lemo 2 for all of you. Today we release the leather case and silicone case for you to protect your iStick 50W better. The black leather case is designed for iStick 50W to reduce abrasion. It is soft and feels great when you hold it in your hand. The cortical texture make your device elegant and deluxe. Owing to the design of side necklace, one can also easily carry iStick 50W around like a pendant. There are totally four colors of the silicon case: black, white, hot pink and blue. They are soft and elastic to fit closely with the battery. One can use them to protect the device from external abrasion. Now, it’s time to dress your favorite device up! The Spring Festival is coming soon. 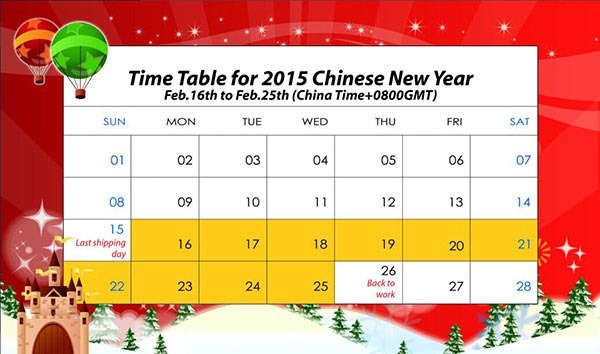 To celebrate this traditional Chinese festival, Eleaf will take 10 days off from 16th Feb.2015 to 25th Feb.2015. We may not reply your emails in time during the holidays. However, if you have any questions or need our help, please feel free to contact us. We will give you response once we are back. Sorry again for the inconvenience and Eleaf now sincerely send you New Year’s greetings and wishes. We are so proud to tell you that Eleaf today will release iStick 30W, iStick 50W and MELO atomizer to bring you more vapor fun. iStick 30W and 50W have comprehensive innovations in the appearance design, the range of output voltage/wattage and the software function. MELO atomizer is designed especially for iStick 30W with stainless steel construction, safe cotton and enhanced coil. The New Year’s Day is close at hand. Eleaf will take days off from 1st Jan.2015 to 3rd Jan.2015. We may not reply your emails in time during the holidays. However, if you have any questions or need our help, please feel free to contact us. We will give you response once we are back. Sorry again for the inconvenience and Eleaf now sincerely wish you and your familiy all the best in this holiday. We are pleased to inform you that Eleaf has opened Serial Number(S/N) Checking System. It helps to verify the authenticity of the Eleaf products you bought. If you have any query or need technical support, please contact us. Tiny yet powerful, the Mini iStick is released today! Just enjoy this pocket friendly device and the satisfying vape it brings for you! The amazing GS Air Atomizer is coming! Streamlined design with shiny silver stainless steel, this atomizer will make your vaping enjoyment “plus”. iSmoka today unveiled the amazing iJust D14 /D16! iJust D14 have two kinds of capacity:650mAh/900mAh for your option, and iJust D16 has the 800mah/1700mAh. Tail mirror LED screen showing parameter clearly and accurately. Using iJustD14/D16 is just a kind of enjoyment! Lemo Drop atomizer has been launched. Lemo Drop atomizer features steel material and glass atomizer tube to ensure the product’s durability and aesthetics. The heating coil can be wrapped around the absorbent cotton by yourself. Also, the air inflow can be adjusted to a desired condition as you please. The National Day will come soon. Eleaf will take 5 days off from 1st Oct. To 5th Oct. 2014. However, if you have any questions, do not hesitate to contact us freely please. We will reply as soon as possible we come back. We would like to take this opportunity to wish you and your families all the best for a nice holiday. 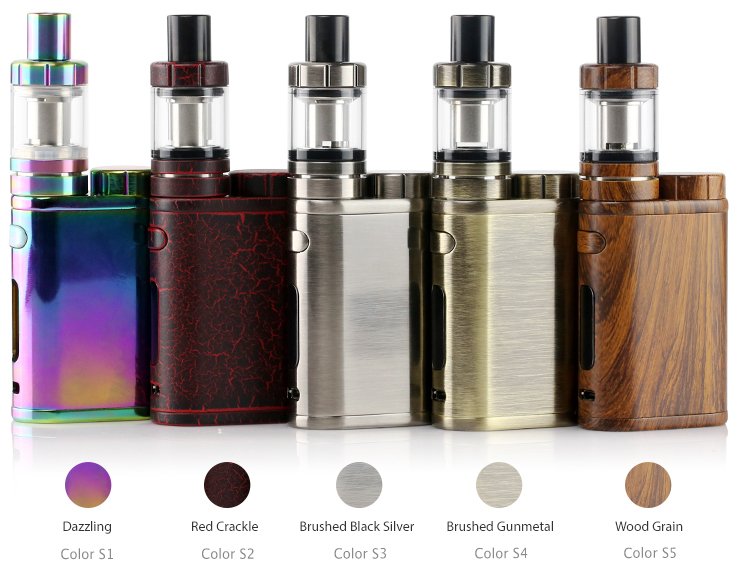 iStick is a new launched kit implementing the latest technology with a metallic appearance. Its trait is the appearance artful, easy to take.There are four colors for your option: black, silver, red and blue. Meanwhile, the output wattage is strong, up to 20W. The highlight is the incremental OLED screen. Come on to try that, and it must be a brand-new experience. Today we are glad to release two new BDC atomizers: GS16 and GS14. GS16 is a new generation of atomizer with fashionable exterior, made of steel and Pyrex glass. Using the clipper-built and pluggable mouthpiece, it brings you a more comfortable vapor feeling. GS14 is a scaled-down version of GS16, and the only difference is in diameter. One is 16.5mm, and the other is 14mm. http://www.eleafworld.com/product/detail.php/gs16.html for more detailed information. Today we announced a new type battery —- Twist Mega. It succeeds the advantage of iKit, but adds more functions: USB port changing design, 11W strong output wattage and 1700mAh capacity. It has a high cost performance.The highlight is that the output voltage is adjustable vary from 3.3V to 4.8V through spinning the knob at the bottom. That’s unprecedented, and must bring a brand new vapor feeling for you. Good news for you that Eleaf released a new type of atomizer for e-cigarette DIY lovers. Lemo features stainless steel material and glass atomizer tube to ensure the product’s durability and aesthetics. The heating coil can be wrapped around the absorbent cotton by yourself which brings you much fun of DIY. Most of all, you can adjust the air inflow to enjoy different vapor feeling as you like. Hope you love it and enjoy the new feeling in your spare time. Today we unveiled iKiss, a superior and mini electronic cigarette with innovative technology and stylish design. Its design mainly shows beauty, portability and fashion. 2. Mini Size: Delicate appearance and mini size make it easy to carry and use. 4. Changeable atomizer head: When the atomizer is broken or need changed, you can only replace the atomizer head, economical and practical. 5. Colourful: Four colours (Black, White, Rose red, Blue) are available, will bring you to a colourful e-cigarette world. What’s more, iKiss is equipped with an exquisite Kiss Box (iKiss PCC). It has large capacity which can charge iKiss continuously, making you enjoy mini E-cigarette everywhere and every moment. Hope iKiss will bring you new feeling and joy in your spare time. iKiss, you will fall in love with it. Eleaf LCD Meter has been launched. LCD Meter, an e-cigarette testing tool, endows with testing atomizer resistance and battery voltage/wattage. With plugging it on the e-cigarette atomizer or battery, you can read the atomizer resistance or battery voltage/wattage easily from its glass window, the LCD Screen. What the wonder is that you can vapor while testing. A new hot favourite of e-cigarette is coming, the Mini iJust. Mini iJust, features the brand new BDC atomizer head, adjustable voltage(3.3-5.0V), lateral recharge, slim figure, transparent e-juice window, high power capacity and so on. BDC atomizer enhances its effective of vaporisation. The function of adjusting voltage brings you different experiences of puff-taking. Apart from these, its color and craft will also be a plus. 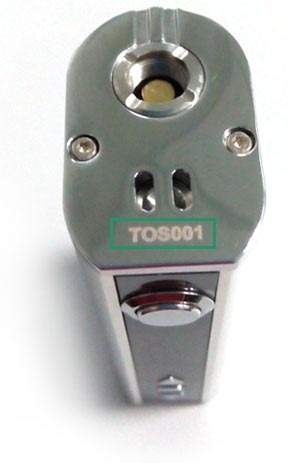 And we have 510 thread and eGo thread for your options. The Mini iJust is your must-try! The May Day will come soon. iSmoka will take 3 days off from 1st May to 3rd May 2014. However, if you have any questions, please contact us freely. We will reply as soon as possible we come back. The Tomb-sweeping Day will at the end of this weekend. Joyetech will take 3 day off from 5th-7th April, 2014. We may not reply your emails in time during these three days. However,if you have any questions, please contact us freely. We will reply as soon as possible we come back. Eleaf BCC-series atomizers are going to greet you soon. From now on, the BCC-CT(Clear Tank), the BCC-GT, the BCC-ST(Steel Tank) atomizers have come out. The peculiar and novel design of integrity of tube endows them their own style. BDC atomizer head, the newest concept of atomizer head from iSmoka, owns two value of resistances, acquiescent 1.8ohm and alternative 1.6ohm, delivering the functionality with product appearance, making the atomizer vaporise more thoroughly. ①Eight kinds of colors (i.e. transparent black, transparent blue, transparent green, transparent yellow, transparent red, transparent pink, transparent purple and transparent.) are available for BCC-CT, but only seven colors (i.e. black, silver, white, pink, rose red, purple and blue.) belong to BCC-GT and BCC-ST.
②The mouthpiece of BCC-GT and BCC-ST is pluggable, just like the previous Eleaf ones. But the mouthpiece of BCC-CT and its atomizer are one. ③Regarding to its atomizer, the BCC-GT/ST atomizers feature two configurations with 14mm (or 19mm) in diameter, Stainless steel with glass window and Stainless stell with plastic window. We push a new e-cigarette by Eleaf, the iJust. iJust, features the brand new BDC (bottom dual coil) atomizer head, the telescopic battery tube and the function of adjusting voltage. BDC atomizer enhances its effective of vaporisation. The telescopic battery tube makes it fit into all batteries of 18- series. And the function of adjusting voltage brings you different experiences of puff-taking. Apart from these, its design and finish will also be a plus. Not only the craft creates a better feel, but the material is endurable in high temperature, resistant in abrasion and antifriction. I’m sure you would like to own one when you know the iJust. As the New Year begins, iSmoka is to launch its new product-Mini iKit. This product delivers top performance with stylish design. Mini iKit’s main draw is its simplicity and elegance. It is highly polished for a beautiful finish and endowed with an elegant air. The diameter of 9.2mm shows its nature of simplicity. These features aside, the improvement of functionality is worth noting too. The application of new atomizer head realises fuller vaporisation. It is hoped that Mini iKit bring you the unprecedented experience. Mini iKit will live up to your expectation. Look! Eleaf designed a new e-cigarette, the iCE! iCE is featured by detachable, washable atomizer and manual battery. There are four colors for choice, namely black, transparent, blue and red. It is pretty easy to use, just press the bottom and get a puff. With the 650mAh and 1000mAh lithium battery, you can enjoy a longer and more powerful puff without any care of second-hand smoke. If you are an e-cigarette fan, the iCE must be your top choice. Last but not least, we hope that the iCE would bring you a brand-new vapor experience and get some positive comments from you. Since iSmoka’s foundation, we have released many kinds of e-cigarette kits and spare parts, such as the new iKit, previous IPIPE, iGo, i118, Magoo and so on. We were sticking to innovation and customer service in the past few years and have transformed from strugging for survival to strategic and systematic brand development. Nowadays, we’d like to announce that iSmoka has its own brand for its products, “Eleaf”. All of our products will use Eleaf brand, like package, logo and so on. iSmoka is the name of factory and company. Hope everyone will not be confused. We hope that more and more users can support and enjoy a healthy and happy life by using Eleaf branded e-cigs. Your inspiration and satisfaction are the best return for us. Lastly, we wish everyone a nice day and happy life! Super! iSmoka iKit manual battery is available now! There are four colors for your choices, silver, black, rose and blue. Just press the bottom to finish a great puff. Except the short-circuit protection and low-voltage protection, it also has charging protection and lock-state in circuit protection. 1.Short-circuit Protection: When short-circuit occurs while smoking, the LED will long light (lasts two seconds) to stop outputting. 2.Low-voltage Protection: When the voltage of battery is below 3.3V, the LED light will successionally blink ten times to enter a sleep state. 3. Charging Protection: When charging voltage reaches the set voltage, it will cut off the charging circuit automatically and the LED will flash 10 times. 4.Lock-state in circuit Protection: Use its charger when charging to unlock the battery. Extra! iSmoka i118 has been released now. The disposable cigarette i118, comes out with particular size, is much more portable and convenience. It has more vapors than other products with about 400 puffs, which can bring you better experience of smoking. The last but not least, it produces less nicotine and tar, which is more eco-friendly. Considering the capacity and convenience of atomizer, we iSmoka released the iCE recently. With the liquid and air separation structure, the liquid will never be inhaled into mouth, and it will never leak. It has a smooth air flow, no blockage, no suffocating and no burnt smell. With graduations displayed, it shows how much liquid you smoked today. iSmoka designs several colors with individuation according to the iCE features. Sincerely hope you can have a try. As time passing, the e-cigs are more and more popular among the public. Variety of designs and brands of electronic cigarettes come out one after the other. Without exception,we iSmoka always take great efforts to bring new concepts to guide the electronic cigarette industry. Here we are launching this kind of e-cig, the eGo! The new iGo is turning up with its beautiful appearance design and long-time vapor enjoyment. No worry about interruption when vaporing, since there is a landmark development. No potential of second-hand smoke, just with your kids and be a “vaporing” daddy and mommy. Good news for every one! We have released a product named iKit, which adopts the latest technology of automatical rear inductor. It is a concept succedaneum of cigarette with collecting multiple protection functions: short-circuit protection, low-voltage protection, overcharge protection, atomizer protection. 5. Both its cartomizer and cartomizer head could be repeatedly used. With the great vapor, just enjoy your life without the worry about second-hand smoke. In order to cater more users, we have designed another e-cigarette–PIPE, whose appearance has a total deference with others. With perfect inosculation and streamline design, it features as traditional pipe. Combined with smart mind, it brings innovation for vapor. Powerful vaporing can meet the needs of most of heavy-vapor customers, which serves you more wonderful vaporizing experience. Here we want to sincerely appreciate for all your supports and praises, especially for those who have donated their enthusiasm and suggestions to the development of our products. We hope that the IPIPE would bring you more convenience and give you a easy life.